When we purchased 308 Warwick, we knew there was a lot of work to be done. Namely, the foundation was crumbling and it needed to be replaced. While we considered this daunting task, we realized we had the opportunity to add more square footage to our little home. With his background in engineering and solar design Michael ran with the idea. He labored many hours teaching himself TurboCAD, a design program, then labored many more hours putting our design ideas onto paper. In short, we have a wheelchair-accessible, 2- bedroom unit built on the lower, front 2/3 of our house, and a master bedroom and bathroom and den in the rear bottom 1/3. The first part of construction was de-construction. Tearing out walls, closets, ceilings, flooring, tiles and a bathroom from the unfinished lower part of the house. I'll tell ya, beating a hammer with all of your might against the wall or ceiling is very fun! Ask Paul - he did much of the work! 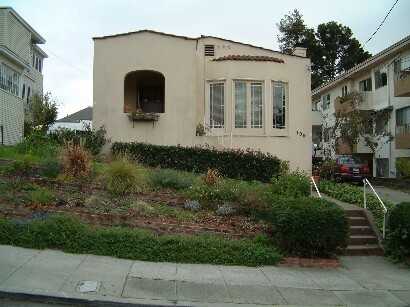 We hired Berkeley Construction to do a majority of the job - removing the old foundation and not-to-code construction. We had over 33 huge dump trucks full of material! They then lifted the house up a few feet. That was a surreal experience! Literally the house raised with hydraulic jacks. Check out the THE LIFT to see those extraordinary pictures! Once the house was lifted new foundation was poured and the whole lower part of the house rebuilt. In the end we dug down about 3 1/2 feet and the house is about 3 feet higher up. Michael installed a radiant heating system (with his lovely assistant) and the electrical system. He also replaced all of the tube & knob (old) wiring and replace it with safer wiring. Quite a job - crawling around in the hot and dusty attic. Lastly the drainage was greatly improved along the perimeter of the lot and back yard leveled off and greatly improved.